It appears Saturday's Palm Beach will once again provide race fans a look at some up-and-coming stars when eight 3-year-olds go to post in the 1 1/16th-mile turf event with 3-year-old horses entered from the barns of Bill Mott, Kiaran McLaughlin, David Fawkes and Mark Casse. One of the likely favorites with great potential is A Thread of Blue. Trained by Kiaran McLaughlin, A Thread of Blue comes into the Palm Beach having won three of his last four starts, including most recently the Feb. 3 Dania Beach at Gulfstream by 3 ½ lengths. The son of Hard Spun, owned by Leonard Green, has won his last two turf races in front-running style under jockey Luis Saez. The colt broke his maiden gate-to-wire on Belmont's main track last October before coming from off the pace to finish third in the Awad Nov. 4 at Aqueduct. “He's training very well and raring to go,” McLaughlin said. “He had things his own way last time, so it worked out great for us. He has speed. He doesn't have to be on the lead, but if he breaks well and he's there, great. If somebody else goes, we can sit second or third. Saez will ride once again. Bill Mott, who will saddle Hidden Scroll Saturday in the $400,000 Xpressbet.,com Fountain of Youth (G2), will send out Casa Creed in the Palm Beach. After racing four times on the dirt as a 2-year-old, Casa Creed won his 3-year-old debut on the turf in Gulfstream's Kitten's Joy Jan. 5 before finishing a troubled sixth last time out in the Dania Beach behind A Thread of Blue. Hall of Fame Jockey John Velazquez will ride. Sandra New's Louder Than Bombs exits a second-place finish in the Dania Beach after finishing fourth in the Kitten's Joy for trainer Fawkes. The son of Violence will be ridden by Irad Ortiz Jr.
King Ottokar steps into graded-stakes company for the first time after breaking his maiden Jan. 9 at Gulfstream at a mile on the turf. Julien Leparoux gets the mount for trainer Casse and BG Stables. 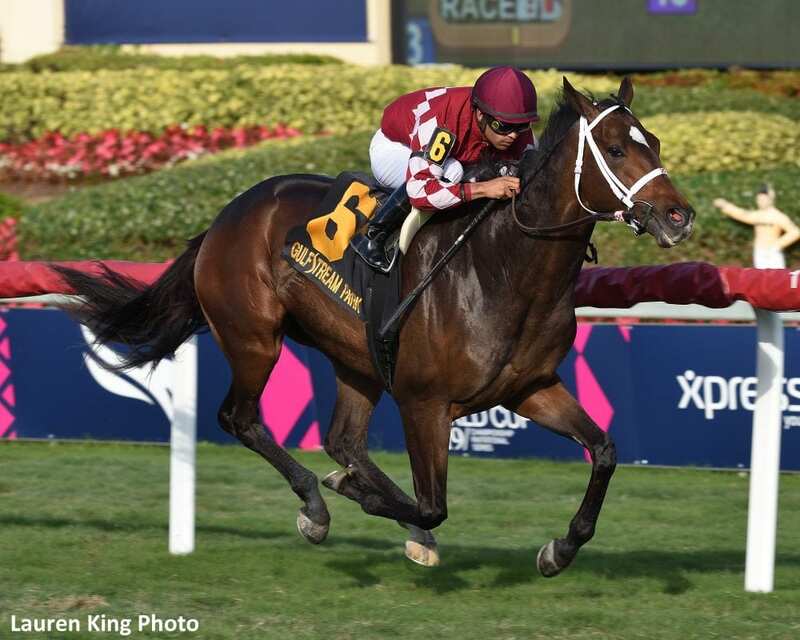 This entry was posted in Racing and tagged a thread of blue, bill mott, casa creed, gulfstream park, kiaran mclaughlin, Palm Beach Stakes by Press Release. Bookmark the permalink.